Synergy Insulation is an industry leader of spray foam insulation. We believe in our product and our service. The solutions we offer Los Angeles area home and business owners for insulating attics, ceilings, walls and roofs are regarded as the most energy efficiency methods available. That, together with our free, no obligation consultation and cost estimate helps our fellow Angelinos save energy and money now! Are you tired of constantly adjusting your thermostat in order to stay cool during those LA heat waves? Or, do you notice cold drafty areas during the winter? Our service offers the highest insulation value over all other products. So, even if you think your home is well insulated with blown fiberglass or traditional batting. Trust us, it can be much better; up to 50% better in fact. Studies have shown that retrofitting your existing structure with our insulation can save you up to 50% on your monthly utility bill! The problem with standard fiberglass materials is that, even at their absolute best, they allow air to pass through the insulation barrier and enter the dwelling. Our product, on the other hand creates an impermeable thermal barrier – it completely seals off your environment and does not allow air, moisture or anything else to pass through it. Additionally, it has a much higher insulation value (known as “R value”) than any other material. In fact, studies show that it is 2-4x better than any other type of insulation. We recommend you apply our product directly under the roof deck. This is the first step in forming a thermal barrier however. However, if you have an attic, you should also use our product on the walls and floor in order to prevent the attic space from super-heating or super-cooling during extreme weather. Having a completely sealed attic is vital because the air that gets trapped in there very easily makes its way into the living spaces through little nooks and crannies that traditional insulation simply cannot seal off due to its design limitations. Studies show that up to 40% of energy is wasted by escaping through your attic or conversely, attic air seeping into your home forcing you to use more energy to combat that influence. Either way, your attic space needs more than just insulation; it needs to be completely sealed. We call this creating a “thermal envelope”. This is especially necessary if your HVAC equipment is located in the attic. Keeping your equipment properly insulated and the ducting sealed works wonders to allow your system to operate at maximum efficiency while reducing unnecessary wear and tear to your equipment, thus saving you more money on premature repairs and replacement. Now, if you are doing a remodel or building a new home, it’s a ‘no-brainer’ to use spray foam in all your wall spaces instead of the permeable and less efficient fiberglass batting. The higher insulation value and the moisture proof capability of spray foam will protect and insulate your property like you never thought imaginable. Having your entire home within the “thermal envelope” will not only save energy and money but will also reduce the invasion of pests like rodents and insects and irritants such mold, mildew, pollen, etc…thereby making your home environment as healthy, comfortable and protected as possible. 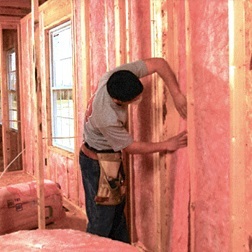 We are well known throughout the LA basin as the most reliable contractor company in insulation. Given the range of temperature that we Angelinos are exposed to all year round, as well as the need to protect your structure we highly recommend that you consider letting us provide you with a quick and effective solution using our state of the art technology. Take advantage of the energy and cost saving benefits that only our service can offer to ensure your home is as healthy, comfortable and protected as possible! The no obligation consult and cost estimate is free, so call now! Whether building new or remodeling, our products can help you go green. Saving energy is just as good for the planet as it is for your bank account. Imagine a world where every home had our product professionally installed and was automatically saving up to 50% on energy consumption. It may not solve all our energy problems but it would be a great start. Plus, our product is non-toxic and does not emit harmful fumes or noxious odors over time. Attic insulation will likely provide you with the biggest “bang for your buck”, so to speak. It offers several benefits: first and foremost, thanks to Synergy Insulation, your HVAC system will begin running more efficiently. Especially if you opt to install our product in the entire attic (roof, walls and floor) as well as around the ducting then you will notice that your heating/cooling unit will be enabled to work more efficiently – yield higher output using less energy. This means lower energy bills and a more comfortable, no hassle living environment for you and your family. And, bonus – since your equipment isn’t working as hard it will last longer and cost you significantly less in repairs and maintenance! Not to be overlooked is the value our service can add to your home if and when you decide to sell. Our product is proven to seal off your home environment better than any other product, which is a great selling point to anyone who wants to reduce the invasion of pests and pollutants into their home. Things like mold, mildew, pollen and even rodents and insects have a harder time getting into your home thanks to Synergy Insulation and its amazing capacity to create a moisture and air tight barrier. Our product has even been proven to add structural strength to the building! It’s a win, win! For help with insulation in your attic or entire home please consider us your number one installer. We are happy to provide helpful tips and pointers over the phone or even better, call us now at 714-793-0590 to get a no obligation consult and price estimate free of charge!